Today, “Housing Advocates for Walsh,” kicked off in Jamaica Plain with housing leaders in Boston praising Mayor Marty Walsh’s efforts to create, build and protect affordable housing in Boston. Since releasing the Housing Plan in 2014, over 22,000 units of housing are either in construction or completed, including 4,000 deed-restricted affordable units. Another 4,000 market rate units that are affordable to the middle class are in production. The City is on target to meet the goal set at the beginning of Mayor Walsh’s term–to complete 6,500 new homes for low-income residents by 2030. One of the first things Mayor Walsh did upon taking office was to convene a task force of over 40 community leaders to author a comprehensive housing affordability plan for the City. Mayor Walsh realized early on that if we are going to increase the amount of affordable housing in our City, we needed to increase housing resources. To date, he has increased the amount of City funding for affordable elderly housing, increased the funding extracted from private residential developments, made City owned land available for mixed income housing, and stood with dozens of housing organizations to get CPA passed. During his first term he has made over $100 million of City funding available for affordable housing and housing programs. In addition to creating new units of affordable housing, Mayor Walsh has also prioritized innovative efforts to preserve affordable housing in our City and protect Bostonians from displacement. Today, one out of every five units of housing in our city are income-restricted affordable housing. Working with the residents of Boston Housing Authority developments, Mayor Walsh has released plans to protect every tenant while also partnering with private and nonprofit developers to reinvest and rebuild our public housing. He also also launched the City’s first Office of Housing Stability to assist renters in housing crisis and has pioneered programs to assist non-profits to purchase market-rate rental apartments and convert them into affordable housing to keep the tenants in place for the long term. Mayor Walsh will continue to support the production of new affordable housing, invest in the preservation of our public housing, work to get more middle income households into homeownership and provide leadership to insist on a regional response to the metropolitan’s housing shortage. His vision for housing in our City is simple – a Boston where people of incomes and all backgrounds can afford to call home. Mayor Walsh has continued to push forward with smart development strategies that also maintain and preserve the character of each of Boston’s unique neighborhoods. With his former experience as a legislator, knowledge of unions, and his roots as an everyday resident of Dorchester, he brings a unique perspective to this work that makes him an ideal advocate for the hard working men and women of the city. Many of the services that are now available to residents under his leadership are exactly what Bostonians need to access affordable living, home ownership and security — and his work is not yet done. I look forward to our continued work together. 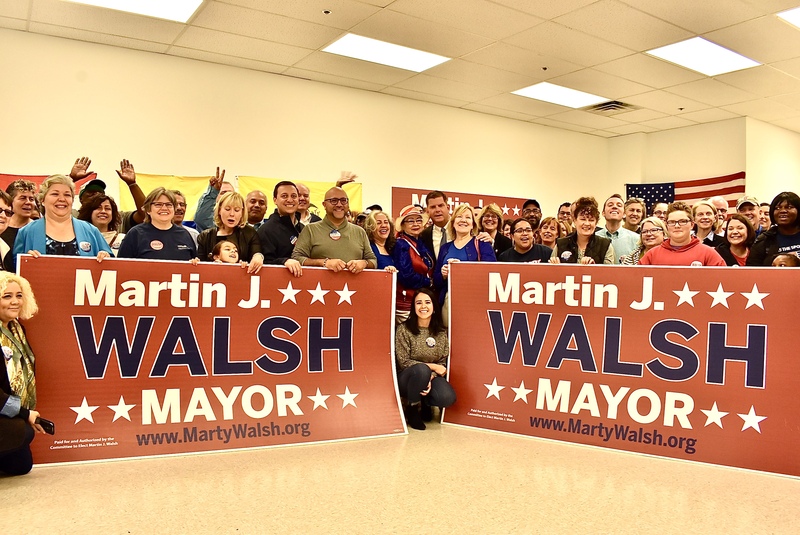 Our communities have found a champion in Mayor Marty Walsh. Since taking office, he has been fighting so each person in every neighborhood has a home. He understands the need for mixed use, mixed income housing, and is a proponent of transit-oriented development. I commend his ability to incorporate each neighborhood’s needs into our housing goals as we grow as a city. Mayor Walsh and his administration have worked tirelessly to solve the housing problems in Boston. As Chair of the Joint Committee on Housing, I have seen first-hand the impact Mayor Walsh has had in fighting displacement and producing new housing opportunities. The Mayor’s demonstrated leadership and unwavering commitment to the residents of Boston is exactly what we need, when we need it. That is why I choose to support Mayor Walsh in his bid for re-election. Together, we can continue our work to make Boston a place where everyone can live. Under Mayor Walsh’s leadership, Boston has continued to flourish. The mayor has been a collaborative partner in local government, fighting to make sure every Bostonian has an equal opportunity to succeed and get ahead. Whether you’re a millennial or a senior, the mayor has fought hard for you over the past three years and will continue to fight for you every day. I know Boston is in good hands, and I look forward to the many more years of public service that we have ahead of us. I have worked alongside Mayor Walsh to protect Massachusetts residents through policies that prioritize community development. With his progressive housing plan and focus on affordable housing options, Mayor Walsh has strengthened Boston’s neighborhoods by working to ensure that everyone benefits from Boston’s growth. Mayor Walsh has demonstrated real courage again and again by leading the effort to create the Community Preservation Act, by strengthening the City’s Inclusionary Development policy and updating the city’s planning and zoning policies. His expanded funding for affordable housing resources has shown his dedication to every Boston resident, regardless of income, zip code, or background, and with his leadership we are working together so that everyone who wants to live in Boston can do so. I was born in Egleston Square in Roxbury and raised in Jamaica Plain. All of the years I have seen the development of public housing and how it has enhanced the lives of middle class people. I know Mayor Walsh is a big factor in creating these programs, and one reason I support Mayor Walsh is because he is an advocate of the middle class and people who need working class and affordable housing.